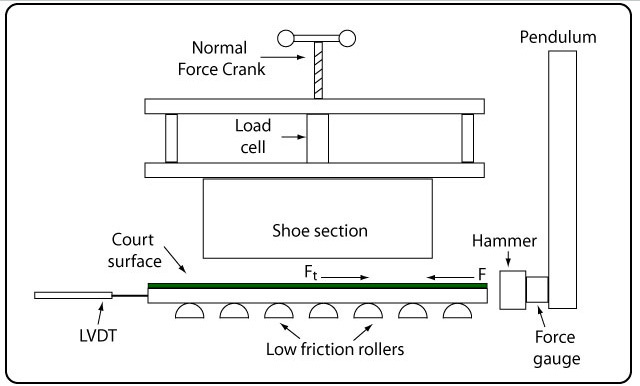 All linear and rotational comparative data are accumulated from tests using a normal force of 150 lb and a horizontal shear energy of 16 J.
Static Coefficient of Friction: Peak traction force (just prior to relative motion between court and shoe) divided by normal force (force pushing court and shoe together). This is the number most often used to compare maximum traction between surfaces. Dynamic traction is measured after the shoe begins sliding and is the force necessary to sustain sliding divided by the normal force. Dynamic traction is not reported here. Peak Traction Force: Peak horizontal reaction force achieved between the shoe and the court when 16 J of energy is applied to the court. Peak traction is a maximum at the instant before relative motion begins between surfaces. The traction force resists relative motion. Load Rate: Peak traction force divided by time to peak force. Very high loading rates are associated with high impact shock to the joints. Shear Deformation: The distance the top and bottom of the shoe move (stretch) relative to each other prior to relative motion between court and shoe. Shear Stiffness: Peak traction force divided by shear deformation. This will influence the comfort of the stopping/sliding motion. Slide Distance: The distance the court and shoe moved relative to each other. Peak Torque: For rotational traction: Peak eccentric force times distance from heel to axis of rotation in middle of forefoot. Rotation Angle: Angle court and shoe rotate relative to each other during application of force. Normal force: Force pushing shoe and court together — 150 lbs (667 N). 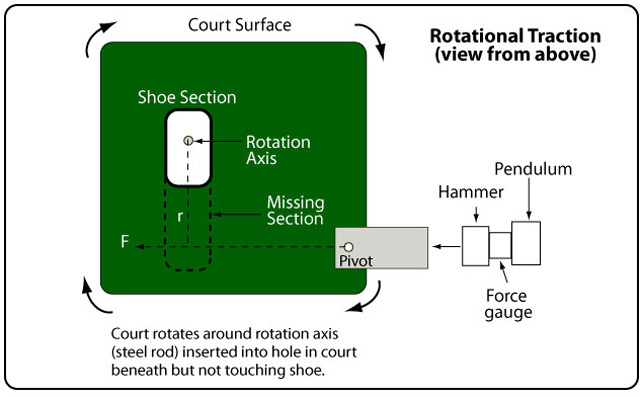 Horizontal impact energy: Energy of the pendulum head as it hits the court parallel to the shoe-court contact surface — 16 J. Figure 1 — Simplified view of the translational traction setup. Figure 2 — Schematic of the rotational traction setup.